Forty years ago, well 41 years, 2 months and 10 days ago, I sat in New York harbor on the SS Pedro Teixeira (a midsized freighter registered at 12000 DWT operated by the Brazilian steamship company, Netumar) waiting for a berth and the start of my new life as a repatriated American. I remember this clearly because it was the day Apollo astronaut Neil Armstrong took the small step he characterized as a giant leap for mankind. Man was walking on the moon and so was I, only it felt more like being stuck in New York Harbor. Our first months in a rental on Vine Street in Broxville went smoothly (I think it was number 25, a duplex, on the right, midway up the street from Midland Avenue, across from the Sorensen’s). School started. Mom and Dad bought the house at number 17, across from the McVicars and we settled into a routine, or at least tried to find a routine amidst the lingering anger over the unwelcome disruption of a forced repatriation. This was before I went off to University, before Bruce became friends with Steve and Dave and a soccer star in his own right (well kind’a), before Gary left home for boarding school, and, I’m sorry to say, before I had any thought as to what might be going on in Nancy’s life. During those first few months after move-in, Mother and Dad did what they could to provide stability and continuity, including, you may have guessed, fixing rice and beans and ultimately feijoada. Mother’s rice was awful, a gooey paste that no amount of salt margarine could quite repair and her beans were bland. In fact, the rice and beans situation got so bad that Mom and Dad called in the experts, João and Nancy Nascimento, and got us all invited down to number 2 Stuyvesant Oval in New York. What a great time we had with the Nascimentos, with Dona Nancy singing Brazilian classics and Dr. Nascimento encouraging Tibério on the guitar and flute and Tobias on the Trombone. Nanstars…, the Nascimento family were in fact “Nan Stars”. 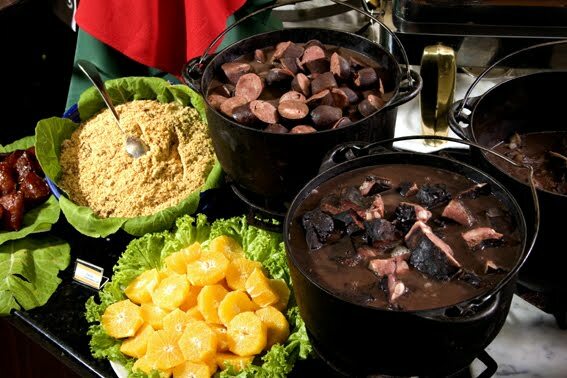 To make a very long story short, over the years I have experimented with red beans and black beans, with all different sorts of sausages and meats (smoked and salted) and have gradually evolved a mean recipe for black bean “feijoada”, with “farofa” and out-of-this-world “garlic rice”. And it just happens to be the 40th anniversary of my graduation from Bronxville Highschool. What is the secret ingredient? Gary actually made this recipe with a few local (to Florida) adaptations and said it was great. Here, then is the product of 40 years’ of on-again, off-again experimentation for your gustatory pleasure. Quantities are variable and subject to the amount of water, beans and meat your pot will hold. (Brazilians use “carne seca” or “sharkey” which is generally a salt-cured, low quality cut of beef. In France I use (200g/8oz) “viande de grisons” for flavor. Viande de grisons is a much higher quality meat (and very expensive about $35/lb) and does not require denaturing. I find that Chorizo (Linguiça) – is not necessary. If you do add Chorizo be careful not to use sausage that is greasy or or overly salted or spicey. Do not drain the beans. Set aside. Chop the onions and put into your cooking pot with (two handfuls) of ground cumin. Let the onions sweat until they are translucent. Add the kielbasa, the chorizo, the pork shoulder and ham hocks. Prepare the tongue, salt beef and ham hocks prior to adding. Cover and place in a hot oven (approx. 270/300 degrees). Cook slowly and stir occasionally. Serve with rice, farofa (coarsely ground manioc flour or what the Hatians might call “semoule de manioc”) and stir fried collard greens.